I can sum up SPA 2008 in one word: perfect. See, the great thing about SPA is that it’s all about doing whatever I want. And last weekend I wanted to hang out with my friends, spin, eat, and drink. I did ’em all last weekend – some of them simultaneously! And I have photographic proof. 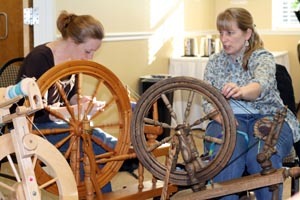 Cheryl and Diane spinning on their Rick Reeves’ wheels. I think Diane’s wheel is the cutest wheel I’ve ever seen. I just love this picture of Julia. I took it at The Jameson Tavern on Saturday night. Twenty of us had dinner there and it was terrific. I’m not doing a link fest but I can tell you that it was a case of rounding up the usual suspects. I’m grateful for every person that was part of this dinner. 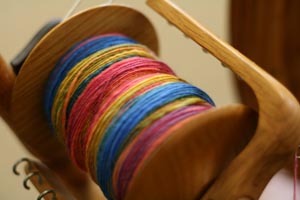 I brought my Reeves wheel, too, and spun up a Crosspatch Creations Paint Pot and this “kaleidoscope” roving from Dave. I love how colorful it is. Don’t get all excited – Dave wasn’t there – but spinning his roving made it seem like he was. You know? It was Lucia’s birthday. We got her a slice of blueberry pie with a candle and we sang. More good times. 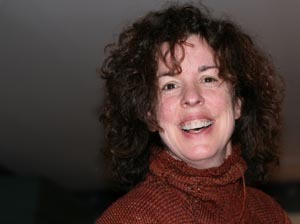 It wouldn’t be any fun for me without Blogless Sharon. That’s her on the right, spinning with Martha. There were wheels everywhere. It’s so great to be among my people. Does that give you an idea of how perfect it was? I may not have a lot of pictures but they are certainly representative of the good times I had. Next year seems like a long time away! it looks like a great time Carole — and all those gorgeous wheels! 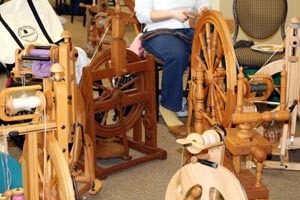 Sigh…sighing with envy for all the fun, for seeing all the grrls, for spinning all weekend, and for smelling fiber. It sounds like a perfect time! It WAS fun, wasn’t it? I just love these little weekends here and there when we all can get together. Weekends like this are the best! It would be fun to have an inventory of the wheels that were there. It was hardly a representation of traveling wheels. You got some great pictures. It really was a perfect weekend. Simply perfect indeed, though the absence of certain friends was palpable. That is a great shot of Julia. Looks like there was a lot more room for wheels than in Portland, no? I didn’t take a single picture! I think I was too busy eating. Seems like every time I turned around it was time to eat again. Almost like being there. Almost. Those are some big honking wheels to be used for travel wheels! I so missed being there. It sounds as if you had a perfect time. Oh, yay for spinning with friends!! I am taking 6 units of cont. 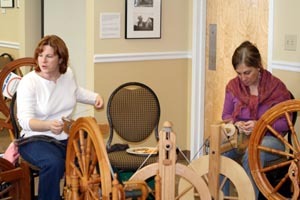 ed this semester and really missing my spinning time. Look at all those smiles! I KNOW you had a good time. Oh, that does look like fun. That’s a whole lot of wheels in one place. I’ve never had a better birthday, and I don’t think I’ve ever been sung to by that many people, much less in public. Thank you! Now I’m starting to miss Madrona. There really was something fun about being in a room with 30 spinners, and 25 different kinds of wheels. Sniff! I went to a spin-in once and it was great! I just love getting together with other spinners/knitters. It’s one of my favorite things in the world! That sounds heavenly! I hope you’re feeling a bit better today! I so wish I was there with all of you. Maybe next year. Glad you had such a good time. It was fantastic — can’t wait for next year! Yep, we were all that happy. Still am over here. It was wonderful to spend the weekend spinning next to you. Thought of you all during the Oscars. It looks and sounds like you all had a wonderful weekend. I hope you’re feeling better today. Wow – what fun times! What does SPA stand for? So jealous! Glad you had fun! there’s nothing quite as wonderful as spinning with friends. Now that I have my wheel, I love hearing about your adventures at SPA even more. It looks and sounds like you had a wonderful time. Thanks for always sharing such great photos of your adventures. It was great to meet you ‘in the flesh’! 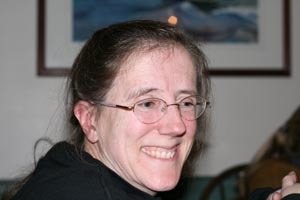 And it was also great to talk with Blogless Sharon for a bit. Did you see how ‘your people’ tempted me??? I only wish I was able to make it up for Friday too. Thanks for the decent photo, and I’m in my new favorite shirt bought that day at Eddie Bauer outlet. I want a weekend like that. That looks like so much fun! Glad you had a good time.